So I started my 4 month sabbatical on Saturday after a heavy nights drinking with work on the friday night in the Tower Bridge Draft House. On the Saturday we had a house warming/going away party which went fine although we now have far too many bread rolls in the freezer.We almost failed with the BBQ but in the end we managed to burn some meat. One of the youngest guests found the novelty or running round inside and out through the kitchen and living room to be most entertaining. kake's lego was got out and played with which is always good. Sunday I spent shopping and finally found a useful piece of luggage for my trip its a Megadecker supposedly.I also bought some elastic so kake can fix my shorts so they stay up instead of fashionably showing my underwear. We also ate lots more meat and rolls. On Monday morning I finally dealt with the bills for the old flat and the new house. Now all I need to do is a few change of addresses for my cards and stuff. For lunch I ate the last of the leftover cooked food from the bbq. There is still plenty of uncooked stuff left in the freezer though. Monday afternoon and evening kake and I did a pub crawl round Wallingtonand Carshalton. Much tasty beer was drunk especially in the Hope it was a good warm up for the GBBF the rest of the week. 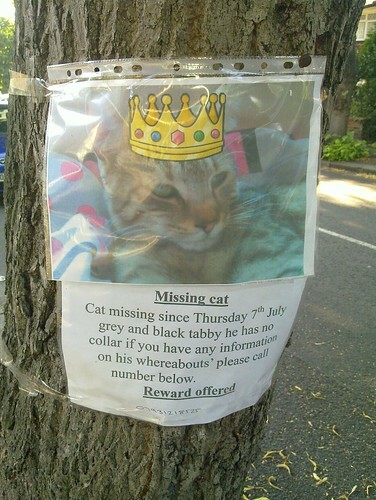 I was slightly disturbed by this missing cat poster. Do they not have pictures of their cat without a clip art crown super imposed on it? 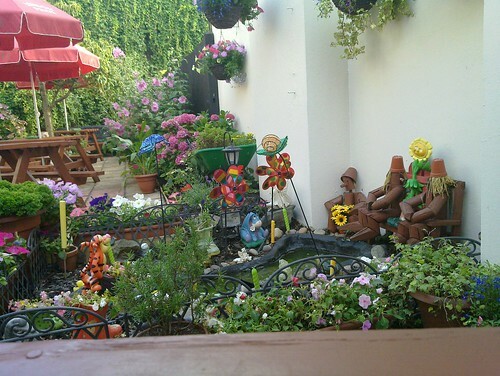 The water feature in the Railway Tavern was interesting as well. Whilst out I had one sms from work.